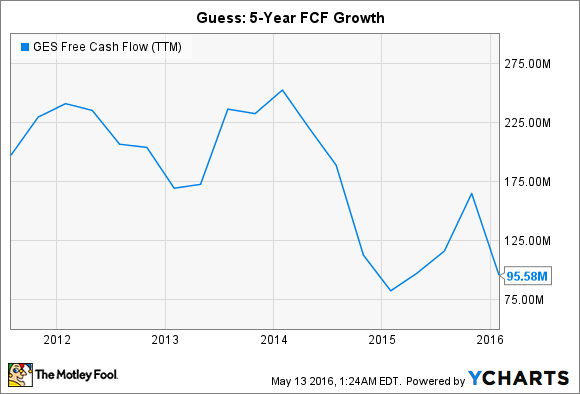 Are These Hated Retail Stocks Good Dividend Plays? Gap's and Guess’ dividend yields look tempting, but both companies face tough times ahead. It's been a dismal year for apparel retailers. The Dow Jones U.S. Apparel Retailers Index has fallen 17% over the past 12 months, compared to the S&P 500's 2.5% decline. Several major retailers recently reported weak monthly and quarterly sales, causing their stocks to post double-digit declines in a single day. Two unloved stocks that fit that profile are Gap (NYSE:GPS) and Guess (NYSE:GES). Shares of Gap have fallen 55% over the past 12 months, and shares of Guess are down 13%. Both companies face similar headwinds -- the rise of "cheap chic" retailers like H&M, fierce competition from e-tailers, and an inability to boost store traffic despite big markdowns. But on the bright side, the declines in both stocks have boosted their dividend yields over 4%, making them tempting investments for income investors. Let's examine both stocks to see if those yields are sustainable. Gap currently pays a forward annual yield of 4.2%. The company has hiked that payout annually for the past six years. Over the past 12 months, Gap paid out 43% of its free cash flow as dividends. That payout ratio looks very sustainable, although Gap's FCF is currently near a multiyear low. The problem with Gap is that all three of its core brands are struggling. The company recently warned that during the first quarter, comparable sales fell 6% at Old Navy, 3% at Gap, and 11% at Banana Republic -- resulting in a 5% companywide decline. In the past, Gap relied on the low-end Old Navy during downturns in spending, the high-end Banana Republic during upswings, and the mid-range Gap as an all-season player. But those declines now indicate that its tiered-pricing business model is being disrupted by cheaper and faster-moving players like H&M. Gap's designs have also been criticized as being out-of-date. It tried to address those criticisms by hiring H&M designer Rebekka Bay in late 2012, but reportedly let her go last year over creative conflicts. The company announced that its first-quarter sales will fall 6% annually to $3.44 billion, which misses estimates by $100 million. Diluted earnings are expected to fall 43% to 45% to $0.31 to $0.32 per share, which are also well below expectations of $0.44 per share. Analysts expect Gap's earnings to fall 20% for the full year. While that decline won't likely hurt its FCF enough to cause a dividend cut, it means that its price could continue falling and wipe out any gains from dividends. Guess currently pays a forward annual yield of 5.6%, but it's only raised that dividend for two consecutive years. Guess paid out 85% of its FCF as dividends over the past 12 months, which gives it less room than Gap to boost its payout. 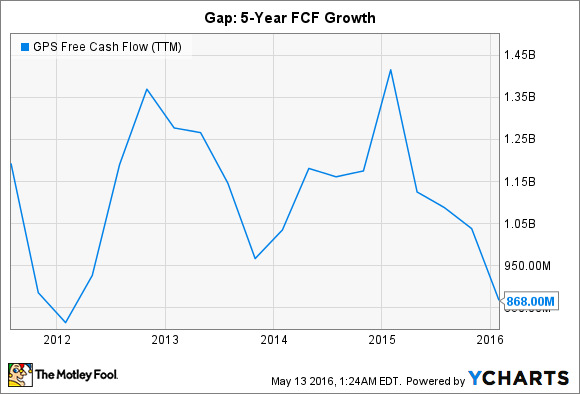 Guess' FCF growth has also remained in a clearer downtrend than Gap's over the past five years. During last quarter's conference call (as transcribed by Seeking Alpha), CEO Victor Herrero declared that Guess could generate "sufficient cash flow" to finance the company's growth as it sustained its dividend over the next three years. As a show of confidence for Guess' dividend and its stock price, Herrero stated: "I have reinvested 100% of my dividends to purchase more stock in our company and I intend to continue doing so for the foreseeable future." Guess faces similar headwinds as Gap, but its declines have been less severe. Guess' comparable sales fell 1% annually last quarter and total sales fell 6%. But on a constant-currency basis, both figures improved year-over-year. Guess is heavily exposed to currency headwinds in Europe and Asia, since only 28% of its stores are located in the U.S. and Canada. Seventy-two percent of Gap's stores are located in North America. Guess expects sales to fall between 0.5% and 1.5% on a constant-currency basis during the first quarter. But looking ahead, analysts don't expect Guess to fare much better than Gap this year, with a projected full-year earnings decline of 19%. Gap's and Guess' dividend yields look tempting, but I'm not willing to buy any shares yet. Both companies must overcome disruptive cheap chic rivals like H&M, Forever 21, and Zara without relying too much on markdowns. They also have to make their styles more appealing for young shoppers again. Those efforts could cause margins and FCF to fall, which will potentially impact their ability to raise dividends. Investors looking for steady income stocks with yields above 4% should stick with familiar names in the telecom, big pharma, or tobacco industries instead of betting on beaten-down retailers like Gap and Guess, which could keep falling.